This time of year always provides several signs that baseball is around the corner. The weather begins to warm up, players report to Spring Training and the countdown to opening day at AutoZone Park dwindles down to a reasonable number. In addition to that, Baseball America releases its top 100 prospects list with the season just weeks away. That list was revealed last night on MLB Network with four names from the St. Louis Cardinals organization on it. While Kolten Wong and Carlos Martinez are expected to make the big league club out of Spring Training, Memphis has a good chance of hosting Stephen Piscotty and Oscar Taveras for at least part of the season. Here is a more in-depth look at the four talents. 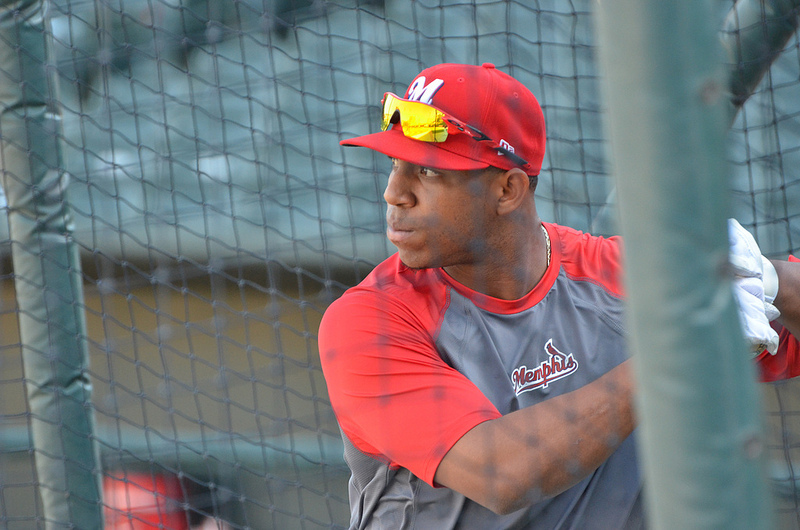 Oscar Taveras: Taveras earned the #3 ranking from Baseball America, the highest of any Cardinals’ prospect this year. The outfielder has been on the radar of the organization after his stellar 2010 season, leading the Rookie-level Johnson City Cardinals to an Appalachian League Championship behind his .322 average. Since then, the 21-year old has hit above .300 in every season and slowly began to hone his power numbers, including a .572 slugging percentage and 23 home runs in 2011 with Double-A Springfield. St. Louis’ top prospect was expected to see action in the big leagues in 2013 before going down with an ankle injury that cut his season short after 46 games in Triple-A. 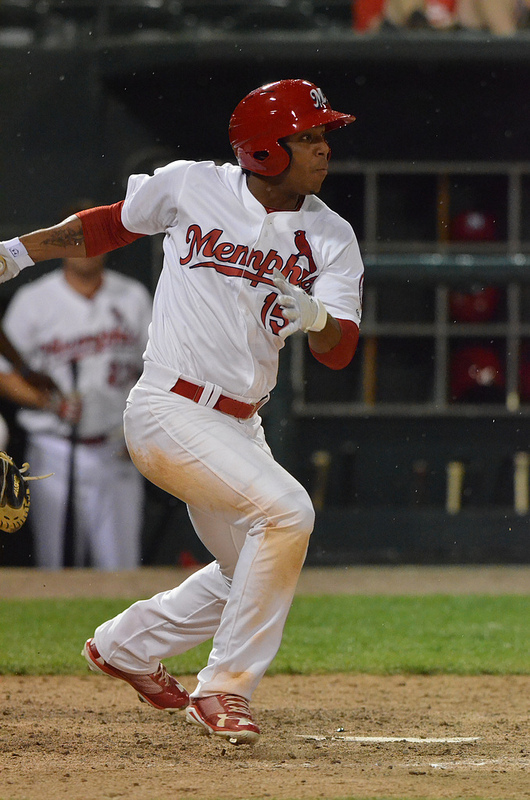 Taveras saw most of his playing time in center field with the Redbirds, although he is projected as more of a corner outfielder once he reaches the major league level. Early reports from Spring Training are positive towards the way Taveras feels on his ankle, as the young player eyes his debut in the majors during the 2014 season. 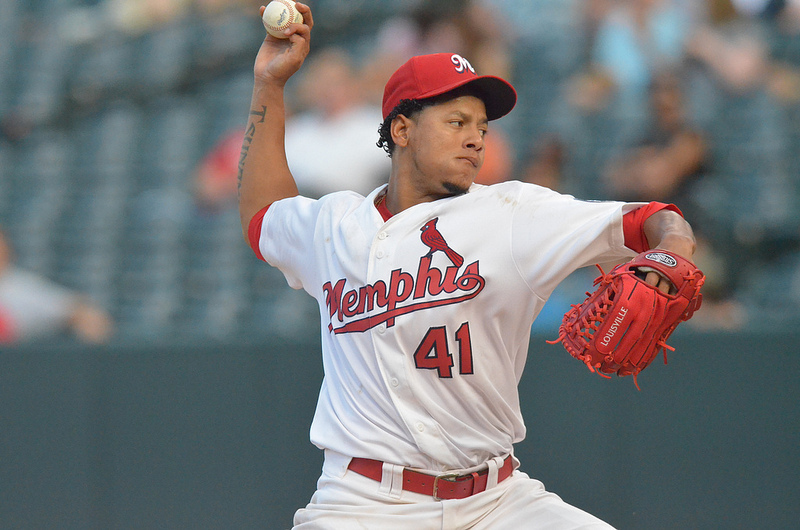 Carlos Martinez: Martinez earned the #31 spot on the top 100 list. The hard-throwing right-hander has been a top three prospect in the St. Louis organization since 2010 and named to Baseball America’s top 100 list since 2011. The Dominican Republic-native was rated as having the “Best Curveball” in the St. Louis organization by Baseball America the past two seasons as well. Martinez has been a Cardinal since 2010, pitching through three different levels in 2013, including the major leagues. A starter his entire career in the minors, Martinez went back and forth between St. Louis and Memphis, pitching as a starter in Triple-A and reliever in the majors. He put up solid numbers in several stints with both Memphis (5-3, 2.51 ERA) and St. Louis (2-1, 5.08 ERA). The 22-year old is looking for redemption and expecting to spend his first full season in the big leagues during 2014, claiming a spot in the bullpen. Kolten Wong: For the third time in three years, Wong’s name appeared on the coveted list, this time as the #58 prospect. The second baseman has done nothing but produce after being drafted 22nd overall in 2011 by St. Louis out of the University of Hawaii. 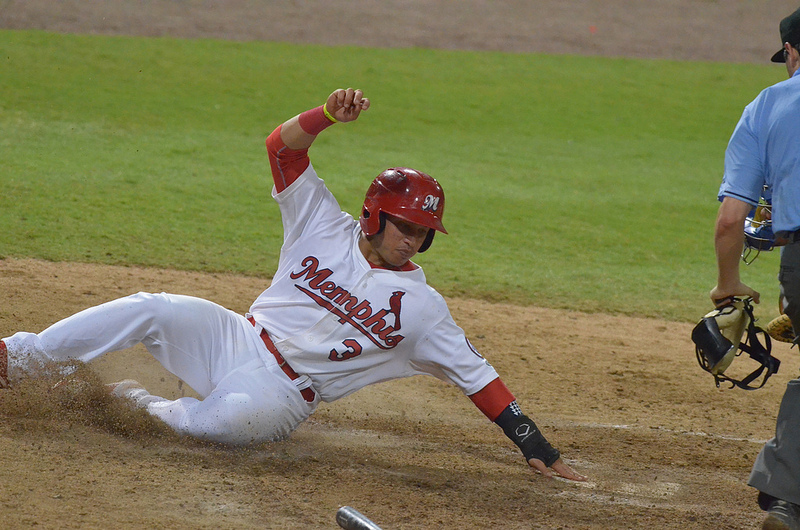 During his three seasons at the minor league level, Wong has compiled a .301 average and recorded 50 steals. Last year at Triple-A Memphis he hit .303 with 21 doubles and 45 RBIs in 107 games and earned a late-season promotion to St. Louis on August 16. The 23-year old struggled to find a rhythm following the promotion though, going 9-for-59 (.153) with 12 strikeouts at the plate. The starting job at second base for St. Louis appears to be Wong’s to lose for the 2014 season. Many project him to man second base for many years in a Cardinals’ uniform. Stephen Piscotty: Piscotty was probably higher on the list than most people thought he would be, taking the #70 spot. 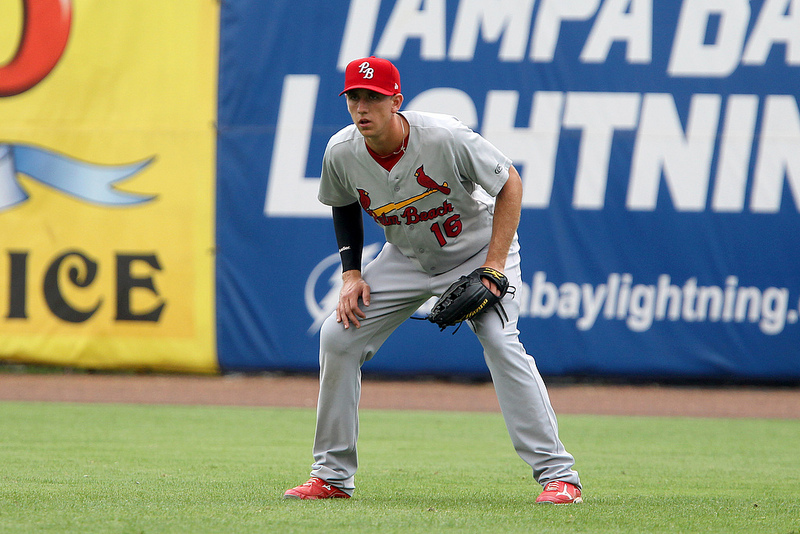 Entering his third professional season after being drafted 36th overall in 2012 by St. Louis, Piscotty has aggressively climbed the ranks with hopes of beginning the 2014 season with Triple-A. The 23-year old was converted from a third baseman to an outfielder after the 2012 season. After being ranked by Baseball America as having the “Best Outfield Arm” coming into 2013, he proceeded to make eight outfield assists and record three double plays. The crazy thing about it all is that his defense is not what he is noted for. After hitting .295 between Advanced-A and Double-A last season, Piscotty took an invitation to the Arizona Fall League and made full advantage of it. With a team-high .936 OPS, the outfielder hit .371 with 18 RBIs in 23 games. If the California-native can put together a good spring, a roster spot could be his to begin the year in Memphis.